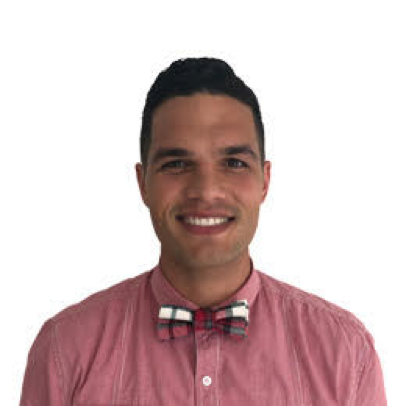 Jordan Aria Housiaux (Te Ati Awa ki Whakarongotai, Ngāti Rauakawa, Ngāti Toa, Te Āti Haunui-a-Pāpārangi) is a marine-freshwater researcher and educator with a particular interest in marine megafauna and population connectivity. Her current research explores the interface between indigenous knowledge and western science and how these knowledge systems can be applied during whale stranding events. ko Ngati Porou me Ngati Kahu ōku iwi. Ko Anezka Hoskin ahau. 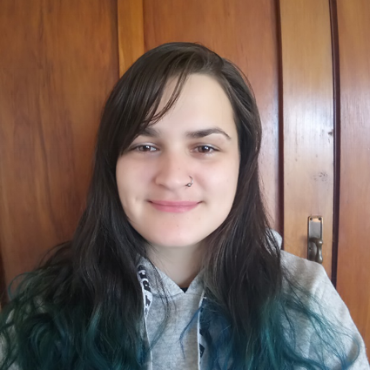 I am Anezka Hoskin, I am 22 years old and currently living in Dunedin, New Zealand. 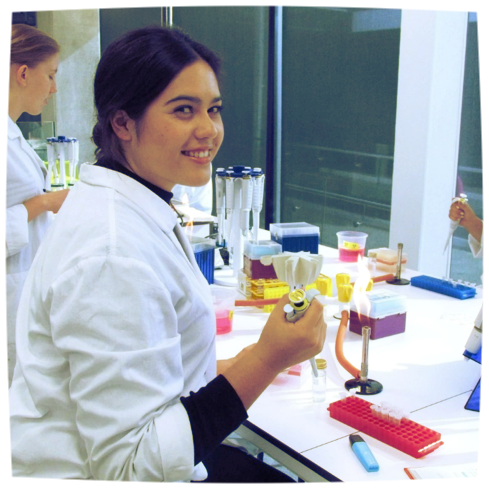 I completed a Bachelor of Science majoring in genetics at Massey University. Now I am at the University of Otago completing a Master of Science, genetics. My Master's research will be investigating genetic associations with gout and type 2 diabetes in my tribe, Ngati Porou. Māori suffer disproportionately from metabolic diseases and I am passionate about using genetics to solve issues that my people endure today. As a young Māori scientist I am dedicated to exploring the space between science and indigenous knowledge forms. I want to expand my understanding and ability to incorporate indigenous knowledge into my thought patterns, lab workflow and data analysis. I am a born and bred, contemporary, indige-urban Māori, Samoan, NZ European. I am presently completing my Bachelors of Health Sciences at Massey University after achieving health related tohu from Auckland University of Technology and The University of Auckland. My faith, love for community empowerment and development, health system restructuring and involvement in a generational lift and shift of the current ideas of Māori and Pacific Island peoples in Aotearoa has driven my present mahi with Te Whanau O Waipareira Trust and Hapai Te Hauora Tapui. With a passion for progression and advancement of Māori and Pacific Island populations, I hope to make a positive change to the present detrimental outcomes these groups encounter. In turn this drives my desire to provide a steady platform for my 2 children to build upon. My goal is to utilise innovative approaches, technologies and determined work ethic to deliver outcomes that have a meaningful and measureable impact for whānau, hapū and iwi collectives. Katrina’s academic background includes, family law, interpersonal communication, alternative dispute resolution (ADR), environmental management, Indigenous knowledge, healing, child development, out of home care and national foster care training. Katrina has worked in a range of private and public and government sector organisations – children, youth, and families; children living with early childhood adversity, persistent developmental delays, special needs, and intellectual disabilities, in her capacity as regional manager, manager of family services, carer, advocate, facilitator, community engagement project manager, policy advisor, researcher, and ADR Practitioner. - (Epigenetics) Does DNA activation therapy work? - DNA activation therapy and healing intergenerational trauma. 1. Phenotypes for molecular genetic studies studying the heterogeneity of intellectual disorders, mal (adapted) conduct disorders in children. 2. Pinpointing the chromosomal and genetic abnormalities in children with developmental delays. 3. Comparative studies with typical development - Implications for practice, diagnosis and treatment. Tag: Epigenetics, DNA activation, epigenetic therapy, intellectual disorders, developmental delays, developmental differences, mal (adapted) conduct disorders, practice, diagnosis and treatment. Katrina lives in Hamilton, is Ngaati Mahuta, Ngaati Maru, Ngaati Tamainupo with affiliations to Ngaati Raukawa, Ngaa Puhi, Ngati Porou and Ngaati Kaahunguunu ki Wairarapa. Alumni of Te Whare Wānanga O Waikato and Te Wānanga O Aotearoa. Ko Ngāti Hine tōku hapū. Ko Te Paea Begman rāua ko Rudy Begman ōku mātua. Ko Nauvoo Begman tōku ingoa. I am Nauvoo Begman, a student in my first year of study for a Masters of Science (Research) degree at Waikato University. My Masters involves working with environmental DNA to detect pests in freshwater systems. I hope to continue studying to gain a Doctoral degree in a genetics or molecular biology related field, then move into a research role. My research interests include Māori genetics, genetic disease, and bioinformatics. I am originally from the sunny Hawkes Bay but now reside in Palmerston North. I attended Kimi Ora Community School and Flaxmere College for my schooling years. I moved to Wellington where I attended Victoria University of Wellington and completed a Bachelors of Biomedical Science (Human Genetics). I then took some time away from uni before returning to complete my Masters (Genetics) which I am currently writing up. Later this year I will begin a PhD in conservation genetics where we will investigate the whakapapa of Northland brown kiwi. I'm Melissa Taane, born in Dunedin. I belong to Ngati Maniapoto. I study at the University of Otago doing a MAppSc in quantitative genetics. I have a BSc majoring in genetics with a minor in zoology. I completed a summer studentship with Plant and Food Research 2017/18. 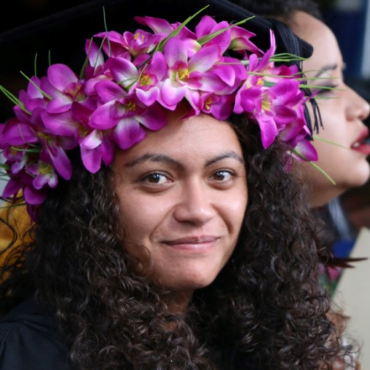 Educated in Waikato, encouraged by her late grandfather and supported by her whanau, Baylee graduated from Te Whare Wānanga o Waikato with a Bachelor of Management Studies and a Bachelor of Science majoring in Economics and Environmental Science. Before graduating, Baylee started working at the Waikato Regional Council sampling freshwater ecosystems and data processing. In addition to working at Waikato Regional Council, she has begun working on valuing freshwater ecosystems in the North Waikato. 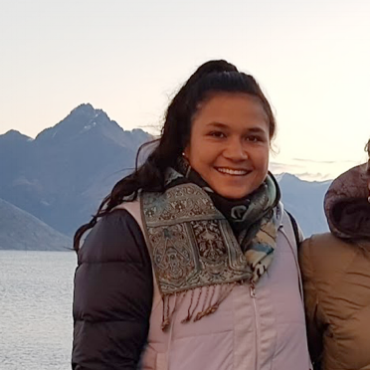 Baylee is exploring different areas of science as an indigenous environmental scientist and economist, developing the ability to explain science in a way that whānau understand and mātauranga Māori in a way that her peers understand. Her future aspiration is to influence government policy to promote equitable benefit sharing for Māori.